Achieving multiple titles in Field, Obedience and Conformation! For the perfect combination of a fantastic hunting dog and exceptional family companion, the Braque du Bourbonnais fulfills both requests. These companions will produce in the field and come home to entertain the children or keep you company while you fix what you've bagged. Only top quality sires and dams are added to our breeding program. 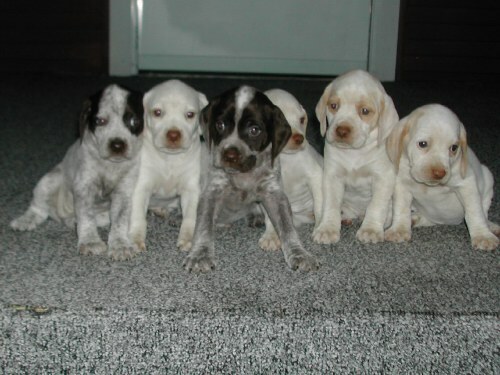 They are a minimum of two years of age and proven to be outstanding family and field companions. The care of our litters starts well before the pups are whelped. Our dams receive the best in nutrition and vet care. To ensure our dams are kept in top physical and mental condition, we train in the off season. As whelping time approaches, the dam makes her nest in the whelping box, which sits in our bedroom. During whelping and the following two to three weeks, our litters are cared for 24/7 by the dam and a human companion. Our litters receive their first "healthy companion" checkup at three days. At this time, tails are docked and they receive a health physical. At two, four and six weeks, the pups receive "healthy companion" checkups which includes de-worming's, their first set of "puppy shots" and an ID microchip at six weeks. Prior to their departure flights, they receive their final "healthy companion" checkup which includes their pre-flight "Health Certificate." By the time our pups are ready for their permanent homes, they have been exposed to several environments. In the home, the different sounds (phone, vacuum, canines, washer/dryer, voices) and constant socialization (children, adults, canines) play an invaluable part of training. The litters are introduced to the outdoors/field around four weeks of age (depending on the weather). At this time we also start "potty/paper" training the pups. As their comfort level rises outdoors, new things are introduced (distance, live quail scent, blank pistol). Approximately six weeks of age, they are on dry food and we begin crate familiarization. At eight weeks of age, the pups depart to their homes as well rounded companions. We utilize the foundation registry for the Braque du Bourbonnais in North America, NAVHDA (North American Versatile Hunting Dog Association). 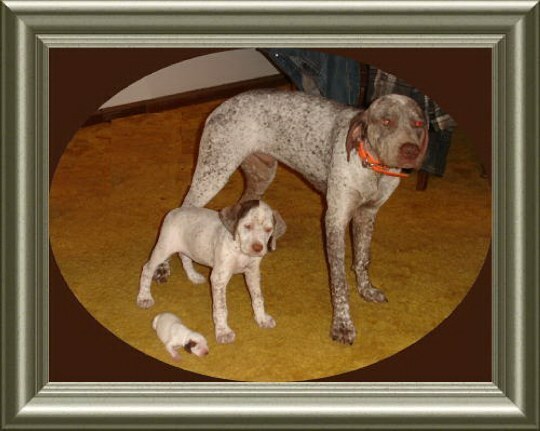 We sell to only responsible owners and utilize the "Breeding Restriction" registration offered by the registries. Rufnit Kennels assumes a lifetime responsibility for the canine lives we place on this earth. We require the dog/pup be returned to Rufnit Kennels should a situation arise and a dog/puppy need to be relocated. at which time they put on weight and fill out.